Bikaner, A centre of great civilization in the past when the sacred river Saraswati watered the territory now comprising Bikaner and the most interesting centres of later Indian Art lies deep in the Thar Desert behind endless sand dunes. After the disintegrattion of the Gupta Empire, the territory successively changed hands with the Gurjar Prathiharis, the Chauhans,the Bhatli Rajputs and finally by the Rathores. 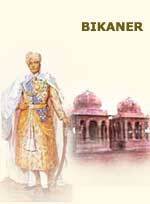 The former Bikaner state was founded by Rao Bikaji, the sixth son of Rao Jodhaji of Jodhpur, a Rajput of the Rathor clan, in 1465 A.D. The city, the fourth largest in Rajasthan, is surrounded by an embattled stonewall, about 7 kms in circuit pierced by five gateways builtby Maharaj Gaj Singh ( 1746 - 87 A.D. ), A magnificient fort dominates the city, which has many other elegant buildings in red and yellow sandstone. Bikaner Fort : Built by Raja Rai Singh ( 1571-1611 A.D.) during the period of 1588-1593 A.D. one of emperor Akbar's distinguished generals. 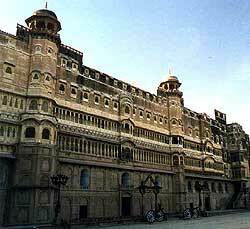 Bikaner fort is an impressive stronghold. Numerous additions were subsequently made by rulers during the next three centuries. The fort forms a quadrangle with a perimeter of 986 metre. It has thirty seven bastions, a strong wall and a 30 feet wide moat. There are two entrances, the one on the west is protected by a double gate. There are several buildings inside the fort Chandra Mahal, Phool Mahal, Sheesh Mahal, Chhattar Mahal, Surya Niwas, Karan Mahal - the palace of Raja Rai Singh with the Suraj Parol, Harmandir,etc. The palace of Raja Rai Singh is the oldest in the fort . Lalgarh Palace : Stands outside the city. It is an imposing edifice of carved red sandstone which contains a remarkable collection of paintings. Ganga Golden Jubilee Museum : This museum houses some very interesting and rare art pieces. It has one of the finest collections of terracottas belonging to the Gupta period. The many Mughal firmans issued to rulers of Bikaner, paintings representing various schools of Rajasthan art,excellent specimens of lacquer work on camel hide and wood and stone carvings are among the other exihibits in the museum. Chhatries : At Devi Kund, 8 km to the east of Bikaner, are the chhatries (cenotaphs ) of rulers of Bikaner. The oldest of these, built of brick and Jaisalmer stone, is that of Rao Kalyan Mal ( 1539 - 1571 A.D.). The 16 pillared chhatries of Raja Karan Singh and Maharaj Anup Singh are the finest and biggest in the group. Gajner Palace : Located at a distance of 31 km to the south-west of Lalgarh Palace Gajner Palace on the banks of a lake is renowned as a place for imperial sand grouse shooting. Bhandar Temple : The Bhandar temple, with its shikha and gilded flagstaff towering above the town is most attractive Built by Oswald Bhand, a rich Jain merchant, in honour of Parasnath, it was completed in early 16th century.